"Take a moment . . . "
As much as we all feverishly look through each new magazine for the hottest trends - there are more important things than a dramatic, new paint colour. More important than a custom-made Ralph Lauren evening gown for the Oscars. 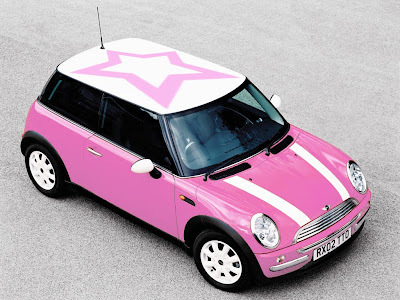 More important than a candy pink Mini Cooper. 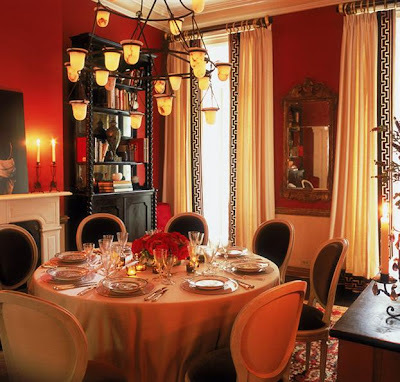 Or even a beautiful room by Miles Redd. 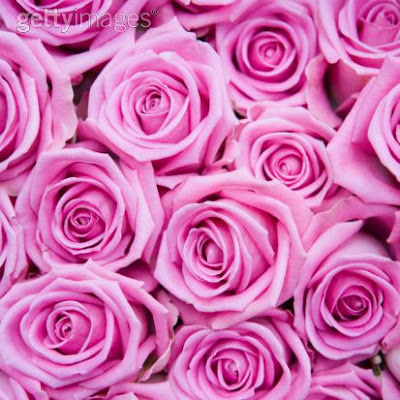 Or a simple arrangement of a dozen roses. And that is your health. 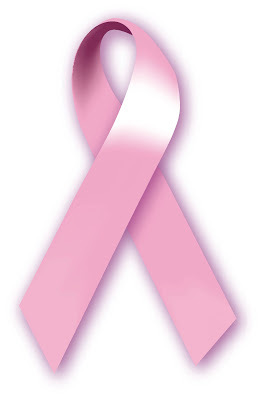 October 1st marks the beginning of Breast Cancer Awareness month. Take a moment and be well informed about the facts. Click here for more information on screening, treatment, and donations. Click here for more information on the Susan G. Komen Foundation. also check out my friends - beach bungalow 8, Mrs. Blandings, Easy and Elegant Life, Cote de Texas, and Pigtown Design for more thoughts on Breast Cancer Awareness month. I can't begin to tell you how proud and excited I am to be a finalist in the "All the Best - Bedrooms Contest." And to know that images of my work (of, frankly, of my home) are in the hands of the judges - Vicente Wolf, Michael Devine, Amanda Nesbit, Todd Romano, Nathan Turner, Kelly Wearstler, and Ronda Carman. The winner will be announced on October 5th. 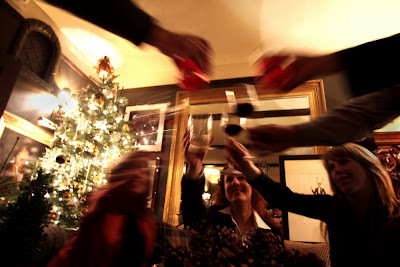 You can peruse images of the top 12 entries at "All the Best" and you can also take part! There is a "Reader's Favorite" contest as well (I'm entry #4). "The Colours of the Ocean . . . "
My ongoing personal challenge - whenever I'm posting about a project from Michael Smith - is to attempt to keep my obsequious fawning down to a dull roar. But, I should also state, I believe he's an absolute genius. This particular project (from a recent Elle Decor), in Malibu on the Southern California coast opens directly onto the Pacific Ocean. I'm truly in awe the wonderful colours in the house. The great variety of blues, from a musky slate blue to the clear, bright blue of the ocean sky. The ivories that feel almost like alabaster or afternoon clouds. The contrast with the rich corals. any studied emphasis or period." 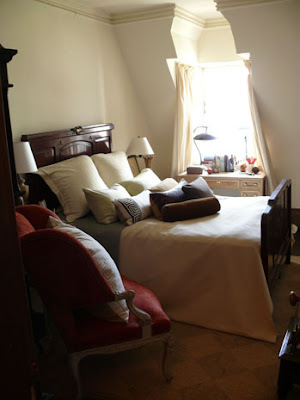 Wonderfully cozy. Beautiful detailed. Practically perfect. 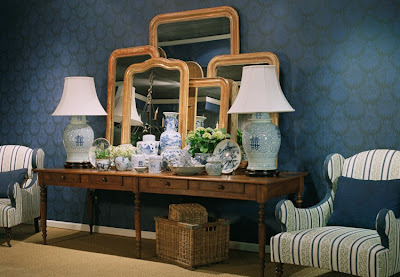 More of the luxurious palette of blues reigns in one of the guest rooms. 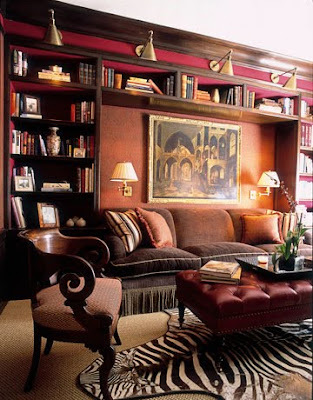 And I love that there are always masses of books in almost every room. 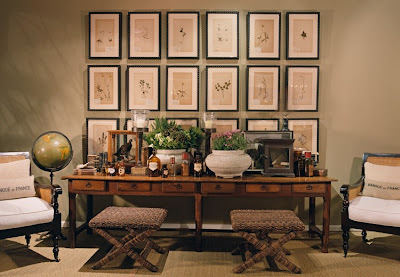 The warm, evening glow from the antique lanterns and the feel of the Tabriz rug under foot. "A Brief Encounter . . . "
It's always such a great delight having amazing people in my life. Several weeks ago my sweet friend David B. said, somewhat casually, "If you're free on Saturday, September 26th, just make plans to spend the afternoon with me. It's a surprise." Well, David and I have known each other for what seems like forever, and I'm more than happy to block out an entire afternoon for whatever he might have in mind. Well, today was the day. We met downtown just after noon. And walked around a bit before heading up Geary Street. And stopped suddenly, in line, for the ACT Theatre - and a matinee performance of Noel Coward's "Brief Encounter." Yay. Heck, double yay. 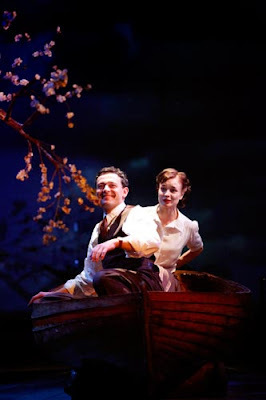 It is a difficult show to explain - to say that it crafts a story and staging from every medium (stage, film, and music) is kind of an understatement. Let me say - it is delightful and imaginative in the extreme. 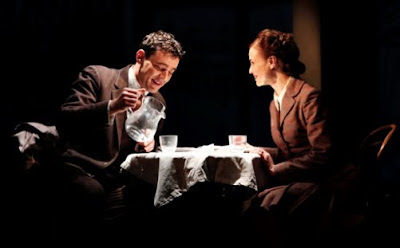 A clever mixture of cinematic elements, lively singing, audience interaction, and a classic heartbreaking love story. And a perfect afternoon's entertainment after a long week's work. Here is the tour schedule - I recommend it quite highly to everyone. "Meanwhile, back in Brooklyn . 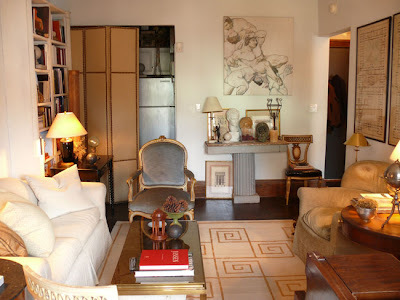 . . "
Just wanted to quickly share the wonderful home designer of Kathryn Scott in Brooklyn Heights (as featured in NYSD in week.) Click here for the complete article and a myriad of images. 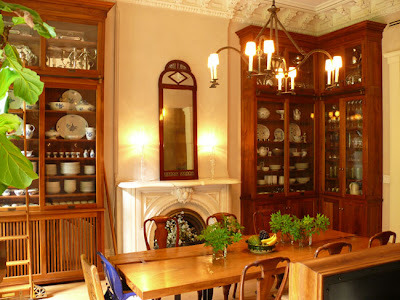 The pictures of the dining room are some of the standouts for me. Such an amazing room. Ahhhhh. The moulding details. The ceiling height. The fireplace. The storage. And click here for more information on Kathryn's work. "Luxury need not be extravagant . 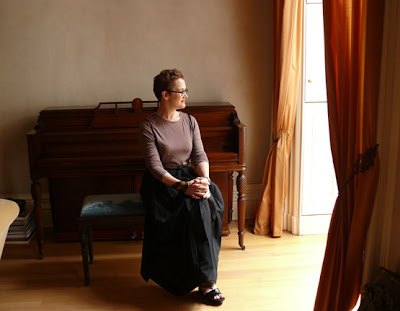 . . "
Where does one begin to describe the wondrously gracious Charlotte Moss? And how does one, such as myself, begin to tell you about the amazing evening . . . listening to Charlotte at Gumps in San Francisco - in conversation with Diane Dorrans Saeks - discussing design, windex, and life in general. "The love of beauty costs nothing." Seriously, how can you beat that kind of inspiration. Charlotte opened the evening with a description of her love of fresh flowers. I think we've all mentioned how special fresh flowers make our homes feel. But now, she's up at the crack of dawn, going to the local flower market - buying wholesale and arranging them herself. And a sea of homesickness swept over me as she talked of her childhood in the South. "My mother would always be the last one out of the house," she said. "We would just be waiting in the car. 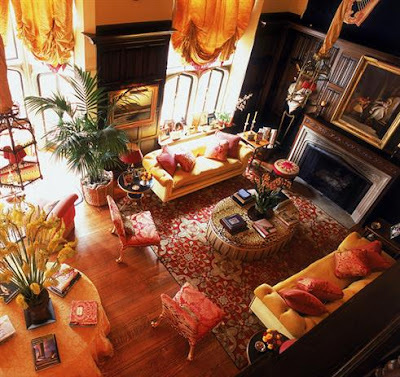 But, we knew she was inside, plumping the decorative pillows on the sofa before she would leave the house. Her reasoning was - 'You never know who might stop by?' And Mother wanted everything to be 'guest ready'." Like so many southerners, there just always seemed to be such a pronounced sense of hospitality in her upbringing. 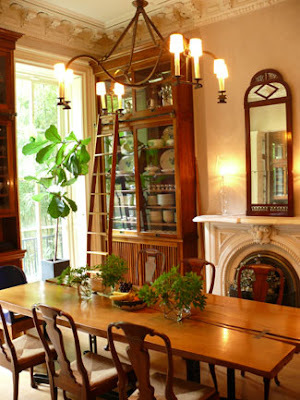 And that specific aspect of one's home, as a place to welcome guests, seems to permeate so much of her very gracious aesthetic. 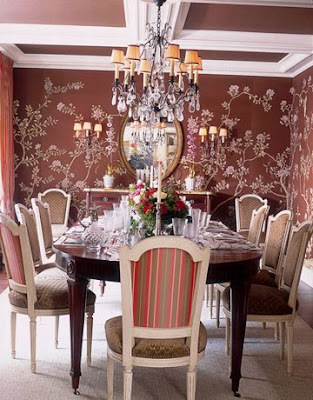 And the advice wasn't limited to interior design, my favourite - "Don't spray windex on antique gold gilded mirrors. Spray the windex on a rag, and use the rag to clean the mirror. Otherwise - the gold gilding begins to turn blue." Good to know. "The Art of Living . . ."
Just getting back into the office from a very long (and very productive) meeting at the house in the east bay . . . so finally letting my brain take a little rest - and getting some much needed food in my system . . . lol. It's always such a delight to work on a project when the client is SO decisive. We made important progress. But that's not the only good news today. the most about who we are. They are as honest as a diary." "Random Acts of Crimson . . . "
How much do I love Alessandra Branca? Great style. Wonderful details. And just a touch a red. Just take a few moments and enjoy . . .
"Something lovely . . . "
Just a little something calm and lovely for your Saturday afternoon. 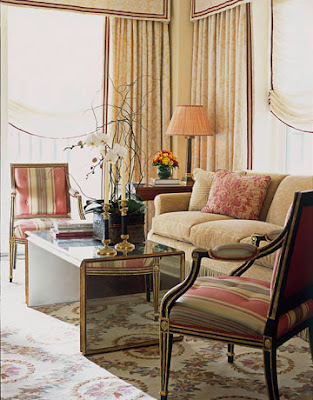 A wonderful apartment on Nob Hill in San Francisco. Click here for the complete article. And what a perfect way to spend one's weekend. "Bad news, Good news . . . "
Yes - it's been a little unproductive here in the "Land of Tartanscot." The last few days have been an exciting ride on the 'I-wonder-if-this-is-just-the-regular-bed-rest-and-fluids-flu-or-should-I-rush-to-the-hospital-flu-?' adventure. After several days of just feeling cruddy but, with nothing more than a low fever, I'm assuming that I'm in no true danger . . . in fact, I've been back in the office a bit today to slice through the mail (both in 'snail' and 'e' format) But, there is good news to balance everything out . . . and quite good news it is . . . Either in some sort of fever-addled haze, or maybe it was the medication - but, last night, I had a crystal-clear, sparking vision of how I want the house to look for the holiday season this year. And not a moment too soon. Christmas is coming quickly! Here's what I'm thinking so far - A canopy of garland stretching from the chandelier in the dining room to the four corners of the room. Maybe the antique German china on the table? Multiple trees decorated with nothing but simple, white lights. And I'm sure there will be pheasant feathers mixed in with the fresh greenery. And somehow, there will figs on the menu. and maybe a rich, warm lobster soup. Hmmmmmm . . . still thinking . 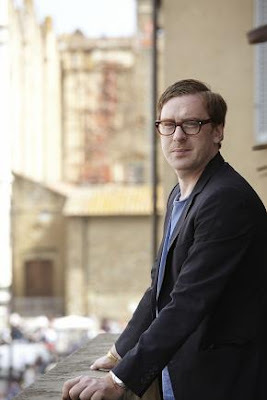 . .
"An Irishman in Florence . . . "
Maybe it's just a bad case of having 'fashion on the brain' after seeing "September Issue" over the weekend . 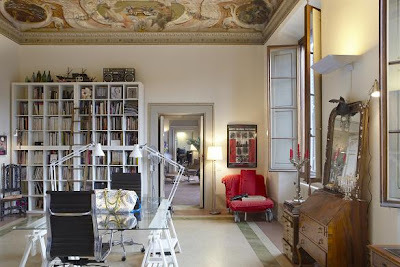 . . but, seriously, how fabulous is the wonderfully chic Florence studio of world-famous handbag designer Pauric Sweeney? 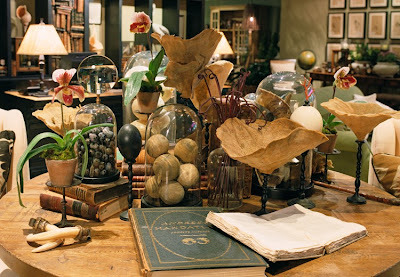 For additional information and images of Sweeney's Studio and Home have a look here. And for another great interview, check here. "Grace under pressure . 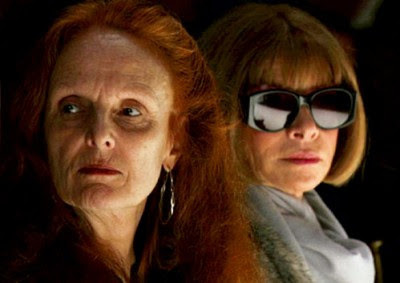 . . "
To even suggest that the new documentary, "September Issue," focusing on Anna Wintour and the fall edition of Vogue might actually 'star' the viscerally talented Grace Coddington may be seen as stepping over the boundaries of hierarchy just a bit. well, maybe not. Let's say 'co-starring.' 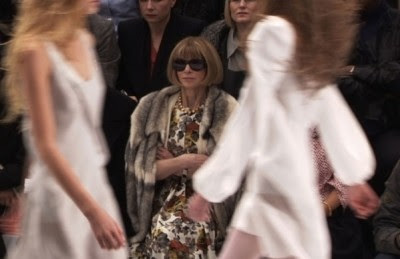 Or maybe they are the best representations of "yin" and "yang" in the fashion industry today. And just wait until you see the myriad of photo shoots and fashion shows. And the mundane events that can inspire such amazing beauty. There was a sublime moment when Grace, the magazine's creative director, is riding in the back of a cab. 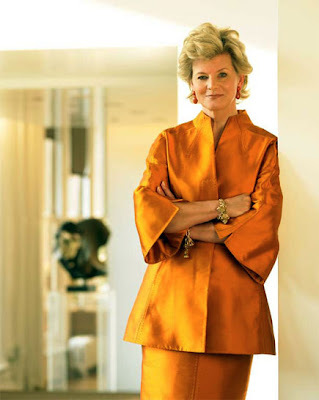 She tells of the advice she received from Btitish photographer, Norman Parkinson, "Never shut your eyes or go to sleep in a car, train, anywhere. You might miss something inspiring . . . " And that, my dear friends, is some wise advice. for the film release dates and cities. "Up a steep and very narrow stairway . 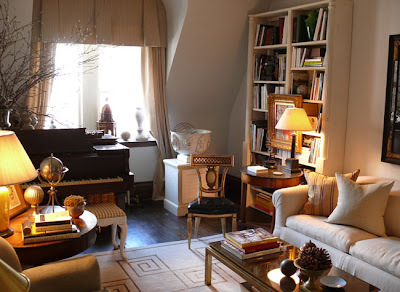 . . "
Once again, I'm simply in love with the simple, elegant colour story. 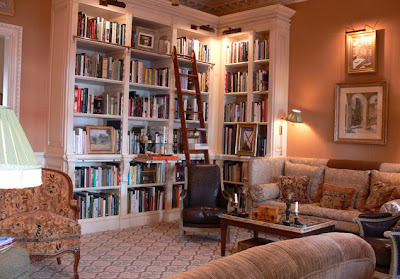 I'm always impressed by anyone with a huge library. 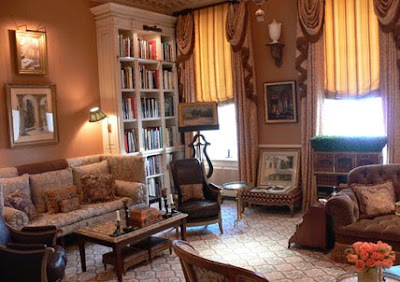 And I love seeing the kitchen tucked quietly away in the back corner behind the upholstered screen. 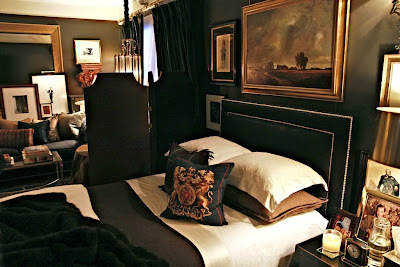 And the charming bedroom. It almost seems like something out of a storybook. 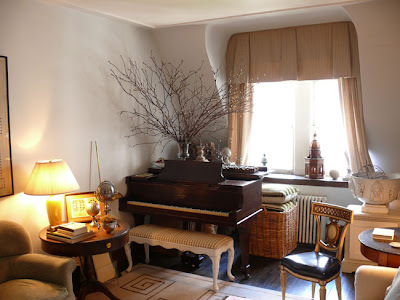 For the complete article from NYSDHome. For more information on Garrow Kedigian.
" Simply beautiful . 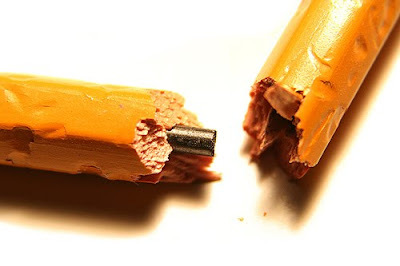 . . "
I'm taking an intentional break from the workload this morning. 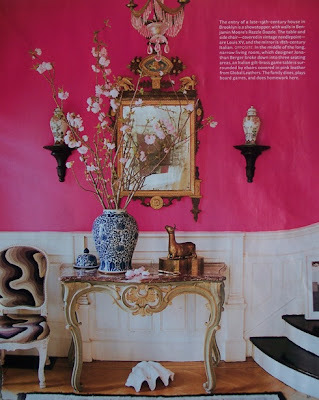 Flipping through design magazines (yay, for the new House Beautiful! ), scanning through some of my favourite designer's websites, and planning some window shopping this afternoon after lunch - are all on the calendar for today. For me, it's such an important part of the design process. 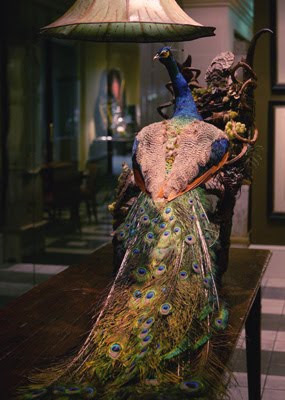 It's never about re-creating something that you've seen, but, more importantly, it's about being inspired by beauty. 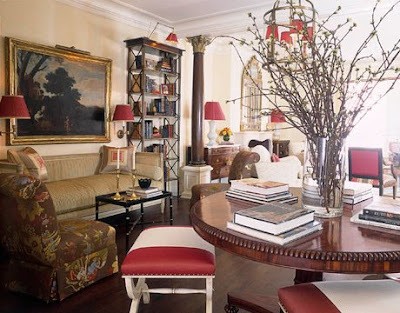 And when you're looking for wonderful spaces, Alessandra Branca is always a great place to start - these images from House Beautiful have always been favourites of mine. 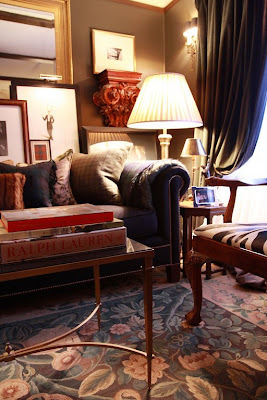 the straight lines of the furniture." Such a lovely room. so light. so gracious. to take the shapes and patterns and find a new point of view for them." There's still a busy day ahead of me, but I'm feeling like my engines are starting to re-charge. for the complete House Beautiful article.
" Grrrrrrrrr . . . "
The good news - I've survived the holiday weekend with flying colours. 2. Great trail run on Sunday with barely any muscle issues or sunburn - lol. 3. Back in the office and feeling REALLY inspired. 1. The house is in a shameful mess. seriously. 2. I have a huge pile of work to slog through today to finish getting ready for a big meeting tomorrow. 3. I have another marketing meeting this afternoon for the new website . . . and need to get some storyboards together - and write some website text. 4. I noticed that I have been blogging shamefully rarely these last few weeks. I've been searching for a topic that moves me . . . or inspires me . . . or amuses me . . . or feels worth writing about. Grrrrrrr. It's either just simple 'writer's block,' or (and I suspect this might be it), I'm directing all of my creative energy towards my own design work these days. Yeah, let's say that's it. So, here's a general 'howdy' to everyone out there. Yes, I'm still alive. And except for my messy house, things are moving along nicely.
" Love, Love, Love . . . "
Whilst looking around today, I happened back across the Dan Marty Design website and was, once again, delighted by almost every page and image. 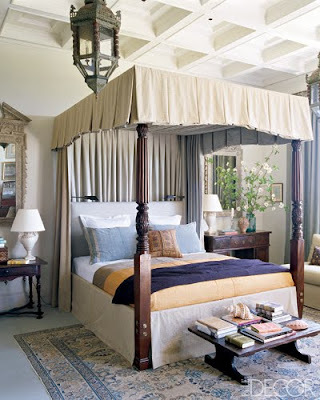 which mixes European Colonial style with California laid back ease." Such wonderful accessories. And such a beautifully detailed space. textiles, warm woods, gunny sack grain cloth and cross bottles." 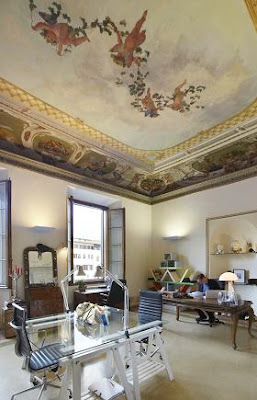 The collection includes; artwork, lighting, textiles, pottery, and a wonderful selection of furniture. "Giggle . . . "
Just found. 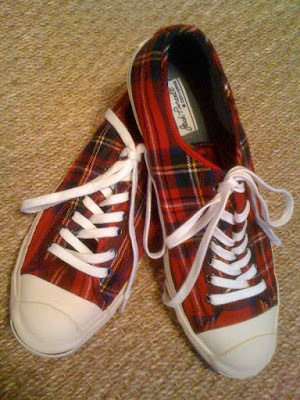 Tartan flannel Jack Purcell's. Yay.